What would a rally race be without turbo charged explosions and gear grinding excitement? 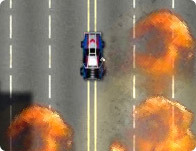 Smash the competition and upgrade your mean machine as you race for glory! Real adrenalin for real racers! Show the best results among the racers of New-York, Monaco, London, Moscow and Tokyo and you will be the winner of the world race championship.